RUSH: Hey. Let me ask you a question, couple questions. Has your pencil, when you’ve been writing or your pen ever misspelled a word? No, no, I’m just asking. Has your car ever driven drunk? Well, depending on the way SUV accidents are covered, for a while there when they were trying to demonize ’em, the media did treat SUVs as though they had minds of their own. SUVs were driving off parking garage roofs. SUVs were killing their drivers ’cause SUVs were evil to climate change. Did your fork make you fat? You’re answering “no” to all this, right? Are you actually thinking about whether or not your fork has made you fat or not? No, no. Did a fork just jump out of the drawer in your kitchen and embed itself in that jug of ice cream and then find your mouth while you were innocently starving yourself watching TV? Didn’t happen, did it? The pencil didn’t misspell a word. The fork didn’t make you fat. And your car never hit a fire hydrant drunk. Ask Tiger Woods. But yet guns are killing people. Well, I’m just sharing with you the kind of logic you get in the town of Realville, where I, your host, am the mayor. RUSH: Okay. We have a switcher here in our revamped Dittocam operation. So I no longer have to hold things up to the actual lens itself. We can actually switch these graphics so that they are on your screen in totality. You know, this stat that is going around, it’s been around since 2015. It originated in the New York Times with Nicholas Kristof that more Americans have died in American gunfire, gun crimes or whatever than have been killed in all American wars combined. (interruption) What? Gun incidents. Yeah. It’s a totally misleading stat because it seeks to make you believe that there are more people dying by way of murder, homicide, than people dying, Americans dying in battle in all of our wars combined. But the fact of the matter is that two-thirds of gun deaths — there are 33,000 on average every year in America — two-thirds of them are suicides. They’re not homicides. They’re not people killing each other. And where people are killing each other, in large measure is being ignored, like in Chicago, like in Detroit, where Democrats run things, everything to do with crimes in those places is ignored and not reported on by the media. And the answer, it’s nowhere near that with two-thirds of gun deaths every year being suicides. Now, the numbers have been broken down. There are murders that take place. The 18-34 age-group is number one, and most of the suicides are elderly men, by the way. When I say elderly, 55 plus. Most of the murder or homicides are taking place in the 25 to 40 demographic. And in the modern era, most of them are in the context of turf wars, gang wars, that kind of thing. It’s not average, ordinary Americans in the Ward and June Cleaver neighborhood grabbing the gun from the safe in the bedroom and walking across the street and shooting the neighbor, which is what they want you to think is going on. And it isn’t! In many cases it’s bad guys popping bad guys or depressed guys killing themselves. And women are involved in this, but not nearly to the degree that men are. Now, put the graphic up, Brian. This is a graphic that comes from the American Enterprise Institute. And what this shows starting in 1993, actually, but the first year published at the bottom there is 1994, the line at the top is the percentage increase of gun ownership starting in 1993. They just chose that as the starting point because it illustrates this the best. The top line, number of privately owned firearms since 1993, we’ve had a 56% increase in the number of privately owned guns. The bottom line is the gun homicide rate. 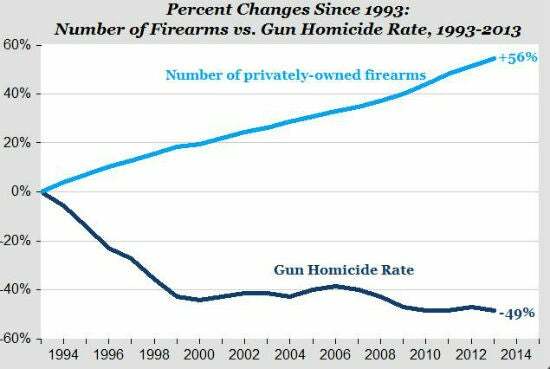 And in the same period, 1993 to 2015 — actually 2014 — gun homicide rates have fallen 49%. Now, the reason for this is that the left and the gun control movement’s out there saying more guns equals more death, more guns equals more murder. We’ve got to eliminate guns. New gun control laws, all this. And this stat proves it’s just the opposite. As the number of guns purchased has gone up 56%, the number of gun homicides, gun related homicides is down 49%. How is that possible, you say? Well, don’t forget the deterrent factor of owning a gun in terms of how it can be used to stop you from getting shot or somebody from being shot, a gun used defensively. How many no-gun zones do crimes take place? All kinds of them. It’s like home burglary, they hit you when you’re not home. People that are gonna commit crimes with guns are gonna go where there’s a no-gun zone, where the good guys are not legally able to own guns. That’s where they go. Schools, for example. You wouldn’t believe the number of places where private — I need to double-check this. I think I read in all that’s been published that the private security guards at the Mandalay Bay are unarmed. Not allowed. Now, I need to double-check that. If it’s not the Mandalay Bay, it’s something similar. All of these new policies, gun-free zones, armed security forces that are not permitted to have guns, it all stems from the fact that the gun is the danger, that the gun is the problem. And it isn’t. Just like your fork didn’t make you fat. Your pencil didn’t misspell the word. But your gun somehow on its own is gonna end up doing horrible, rotten things. It defends people, and Democrats are going to have just a fine old time trying to convince everybody that you need to give yours up. I submit to you that every time an event like this happens and the left starts caterwauling about gun control, what do you think happens? People don’t take the chance; they don’t trust Washington anymore. They know that at least one political party wants to take their guns away. They know it. The Democrats will not front-and-center admit it, but people know it. So what happens? The Democrats go nuts, start demanding new gun control laws, start alluding to the fact that there’s too many guns. I’m telling, you Democrats that get on that riff, you have no idea what you’re doing. You have no idea who you are insulting. You have no idea. You see, most of the country doesn’t see prayer and religion the way you do. Most people’s religion is not a tree or a policy. Most people’s religion is what you would think a religion is. But it ain’t yours. Every time you start caterwauling about guns and every time you start demanding that either guns have new restrictions placed on them, new gun laws or worse, all you’re doing is driving people in the hundreds of thousands to the nearest gun store. And they’re stocking up. Decent, good-hearted American people who are buying these things for protection, you are ramping them up. When you start attacking prayer, when you mock it and you have no idea what people are praying for, what you’re telling us is that you think it’s worthless, that it’s irrelevant, and it’s probably not even real. When you start mocking people who pray, when you start, “What good is prayer after the event? What, are you asking God to stop it? Well, it’s too late.” That’s what Elizabeth Warren said. That’s not what people are praying for, Fauxcahontas. You ever stop to think they might be praying to God for the salvation of the souls of the dead? Or does that concept not connect to you? Anyway, they are the reason gun sales are way up.